Imagine your day that starts and ends something like this: No one waking us up in the morning after the alarm clock has failed to do its job. Not able to find that black dress or shirt which you wanted to wear today, no breakfast or lunch prepared, the room looks like a mess, and you don’t remember where you kept your watch last night when you were too sleepy to keep it where it belonged. Now, this is just the start and when you have a bad start your entire day is already doomed. This is the condition of most unlucky ones who do not have that miracle angel called “mother” or are living away from their moms. Mother do a lot without making their children realise or expecting something back in return. Whatever we do, it is impossible to thank our mothers for all the sacrifices they make. The least we can do is celebrate special occasions like her birthday, Women’s Day and most importantly Mother’s Day. Mother’s Day this year falls on the 12th of May 2019. 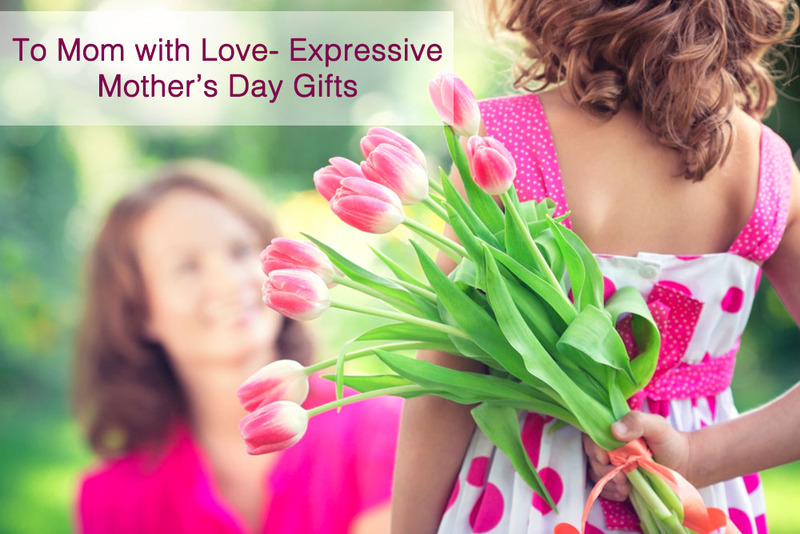 IGP brings some of the most expressive and thoughtful Mother’s Day gift ideas that feel like they are made especially for your mother dearest. A gourmet hamper that says ‘you are very special’- that’s the perfect gift for any mother. 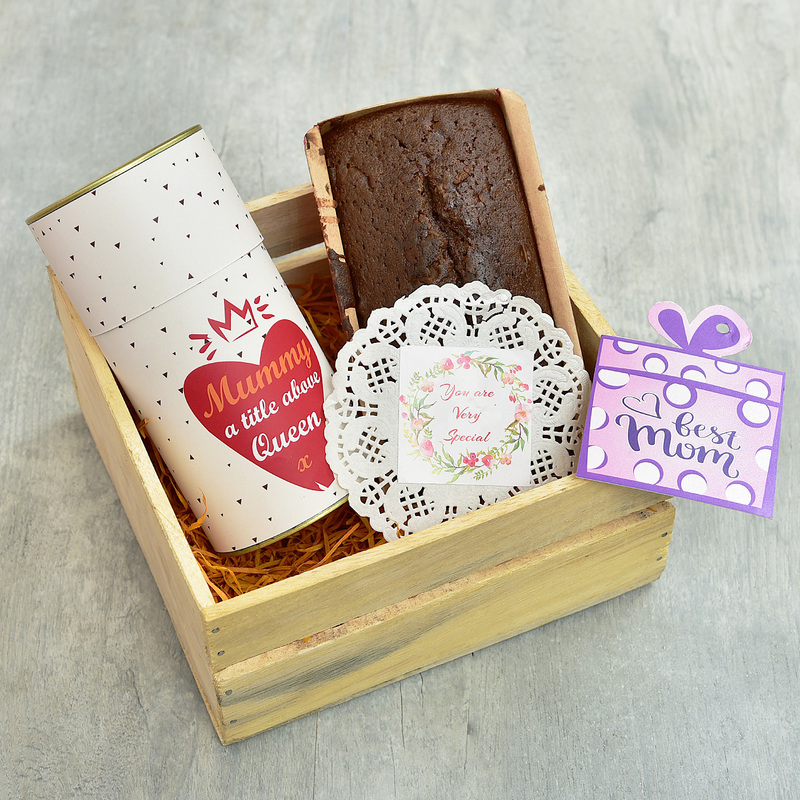 This special Mother’s Day gift idea has a rich chocolate cake bar along with walnut cookies in a stylish can. Both the treats come packed inside a wooden tray, which can be reused by your mother for storing her knick-knacks. She is the epitome of strength, who went through the pain of giving birth to you and the challenges of raising a misbehavioured you. And undoubtedly, she has been your first true love. 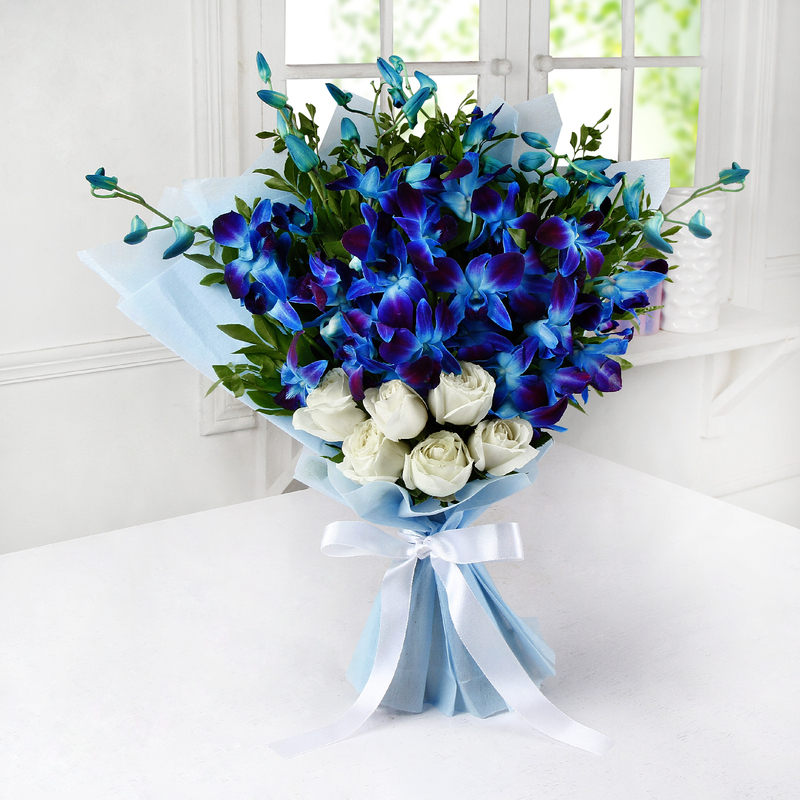 So get this beautiful hand-tied arrangement of blue orchids and white roses that stand as a tribute to your one in a million mother. 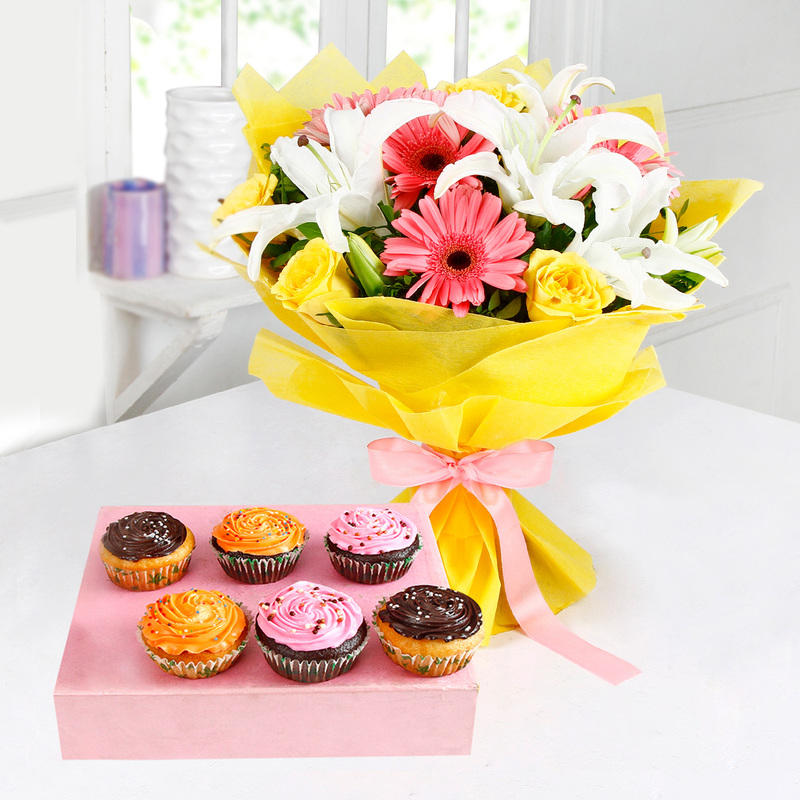 If you are looking for a more exciting gift than just a bouquet, we recommend this mix flower bouquet with assorted cupcakes. The tissue wrapped bouquet includes stunning and fragrant lilies, roses, and gerberas. There are 6 cupcakes in different flavours that are sure to delight your mother’s taste buds. If your mother has a green thumb, she would love to receive a plant to add to her growing garden. Your mother can decorate her living space with this bamboo plant and benefit with its good luck bearing quality. Along with the plant, this Mother’s Day gift idea also has soothing and nourishing St.Ives body wash. There is also a good wishes card included in the hamper. Surprise your mom this Mother’s Day, with this awe-inspiring Mother’s Day gift idea. 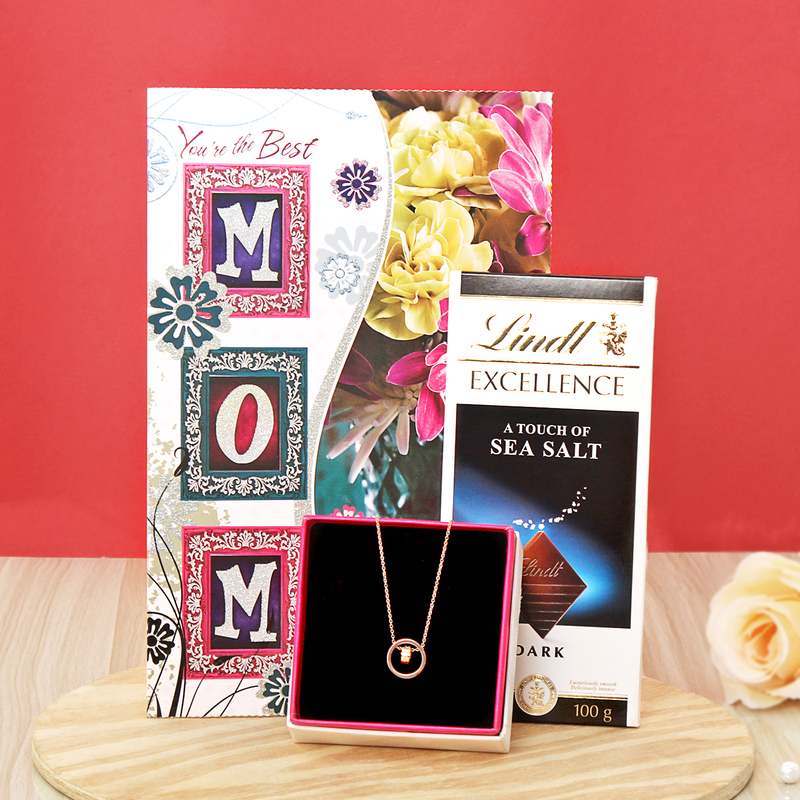 The star of the hamper is a rose gold finish necklace, which is surely going to look pretty on your mummy. Along with it, there is a Lindt Sea Salt chocolate bar and a happy Mother’s Day greeting card. Bangles are the most picked jewellery piece for mothers. If your mother likes adorning herself with jewellery, choose these luxurious looking but budget-friendly bangles for her. The bangles are studded with different sized pearls that draw a stunning pattern across its round surface. 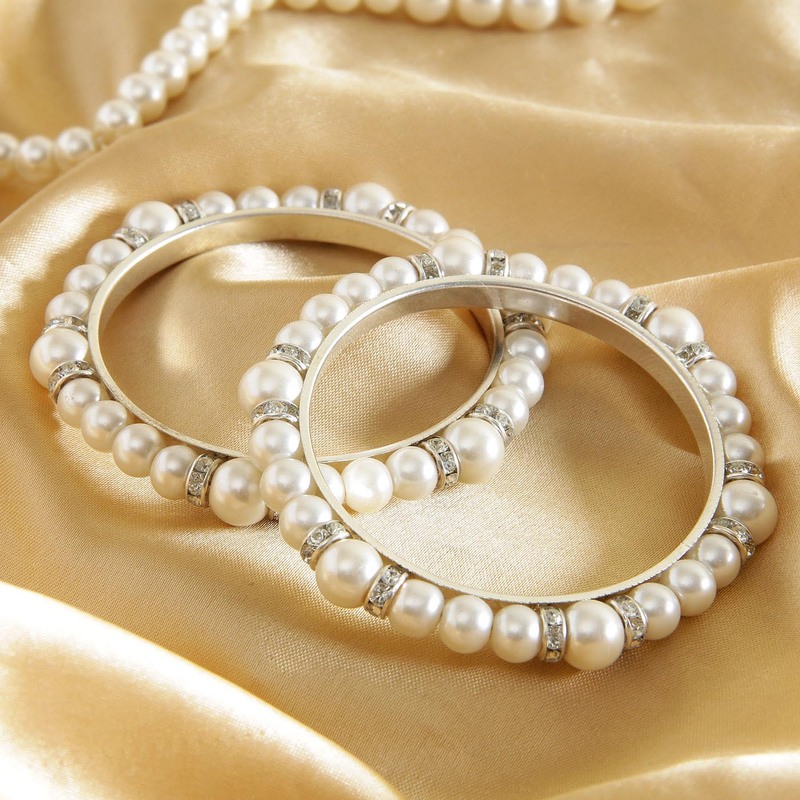 Complimenting the white pearls are crystals that add a charming touch to the pair. She has spent countless days and evenings thinking and cooking up the most delicious dishes for you. Now it’s your turn to pamper her with a lip-smacking treat this Mother’s Day. 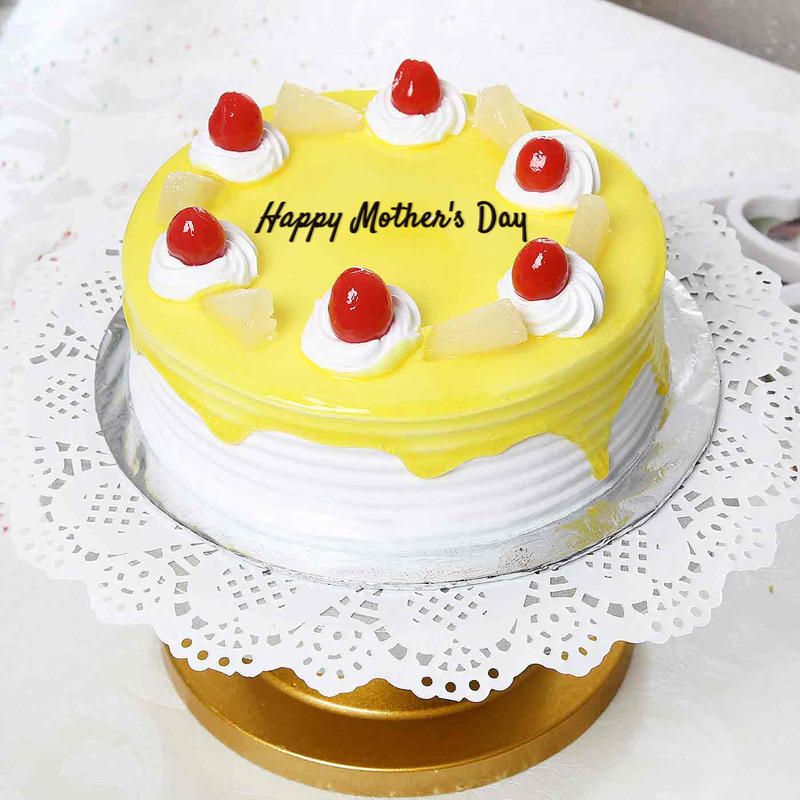 Our delicious and fresh pineapple cake is among the most loved Mother’s Day gift idea. The half kg cake is creamy and soft and topped with cherries. If she is a working mom, then you can consider this Mother’s Day gift idea for her. 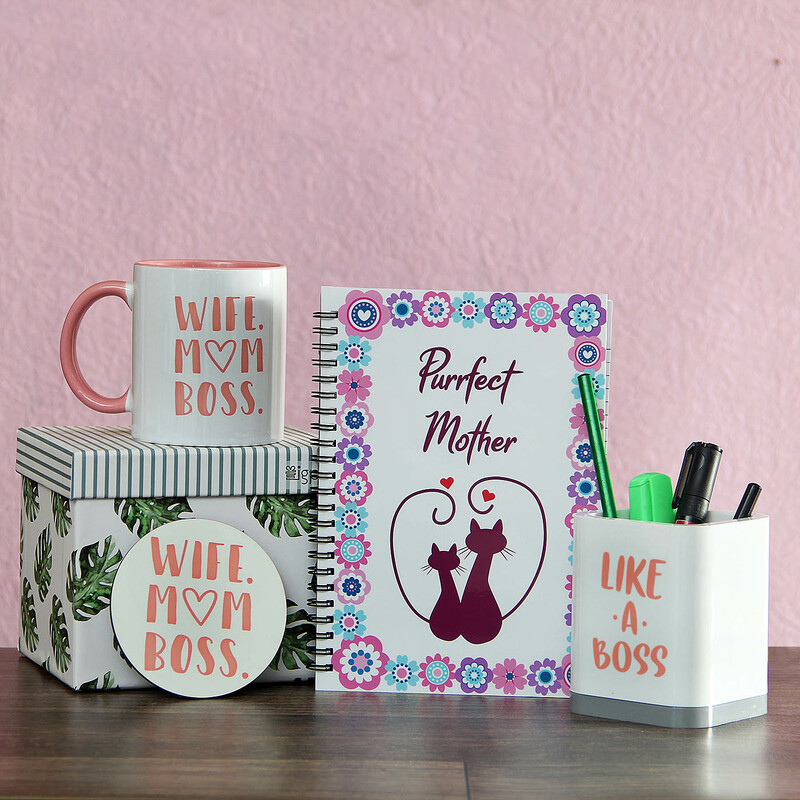 This hamper includes desk accessories like stationary holder and mug with Like a Boss, Perfect Mother, etc. written on them. These will help her stay organized and fresh all through the day. She will finish her work on time always and come back home to you quickly. 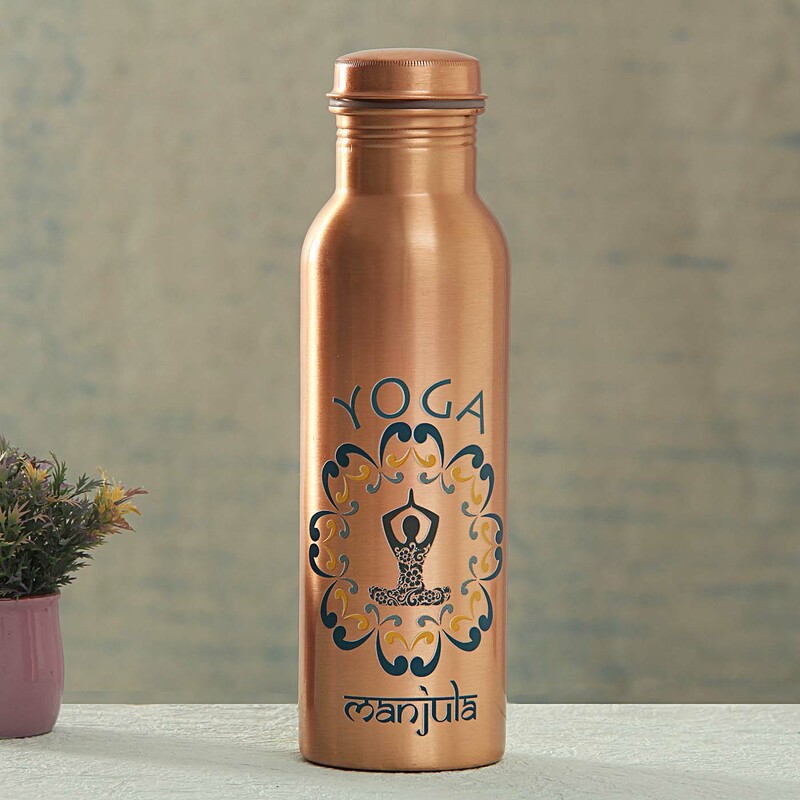 For your lord Shiva and Parvati bhakt mom, nothing can be a better gift than this. 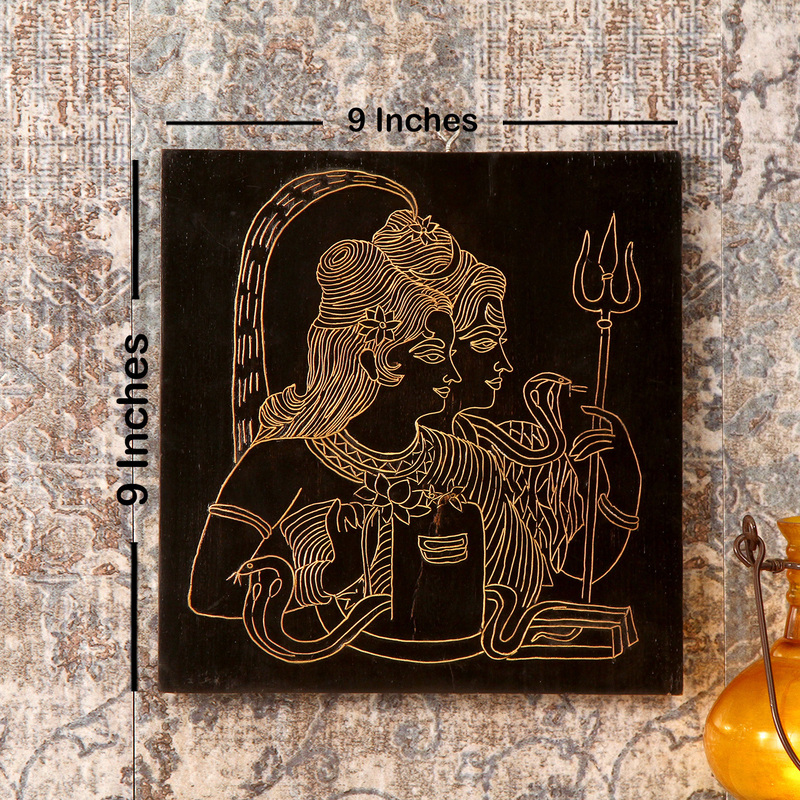 This beautiful Shivalaya Tarkashi painting is 9 inches wide and long and can easily fit into the crampiest wall easily.